The Capital Barbie: A Bouquet for Me? Yesterday we looked at some spring skirts. Today, let's continue the trend and hope for warmer weather. Let's look at some watercolor inspired florals that are perfect for right now. 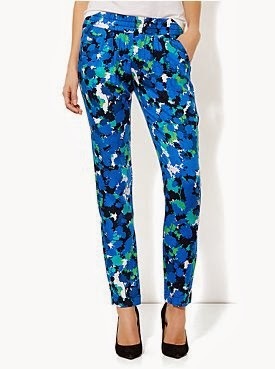 They're graphic and colorful and they are just what we need on this hump day. I'd pair this sweet print with leather pants, because I'm wild like that. And check out the back of this cardigan, didn't see that coming did you? I love this mix of black and blue here and the pops of white just freshen it up. How about a big graphic print? I love the bright colors and midi length of this pencil. 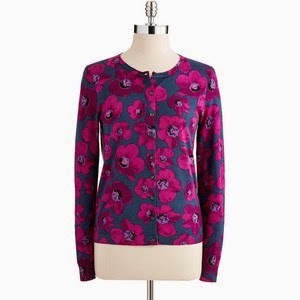 Guys if you need me, I'll be over at Landsend.com because this floral is just perfect. Florals aren't just for the middle of spring and summer, try them now with your closed toe shoes and a cardigan. Bright colors will make spring come faster, promise.